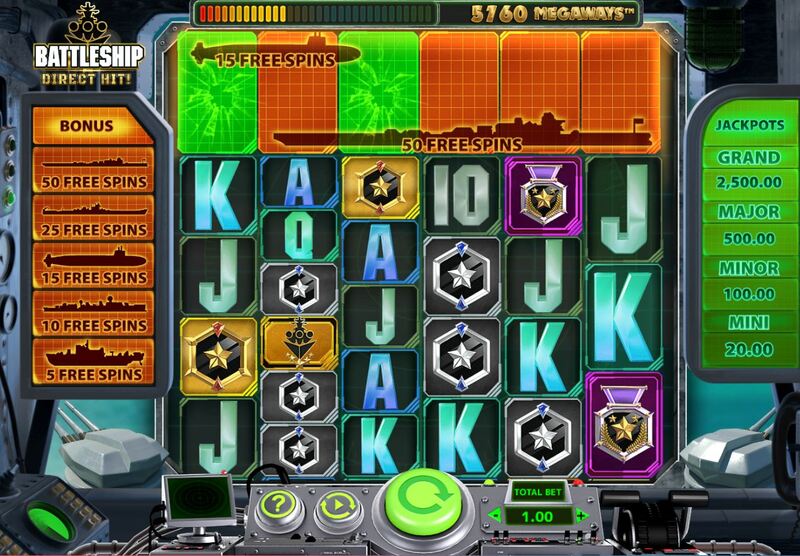 Battleship Direct Hit Megaways slot by WMS play the demo here! Battleship Direct Hit Megaways slot is WMS' or Scientific Gaming's first use of the Megaways mechanic licensed from Big Time Gaming. The theme is obvious and features naval music and your grid is set on the bridge of a battleship which makes good use of its armaments during you play. The game is simply the original Hasbro theme Battleship Direct Hit slot adapted to its new mechanic and bearing in mind what a lost opportunity that was, one must hope this game will be an improvement. So will our bankroll rule the waves, or end up taking a full broadside? 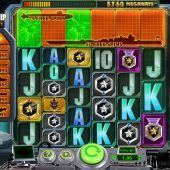 As with most Megaways slots such as Extra Chilli and Diamond Mine any winning symbols are removed from the grid on Battleship Direct Hit Megaways but there is a difference here, as we get 324-117,649 ways on any given spin but this doesn't include a top scrolling reel so you cannot see any 2-row reels land like you can on those scrolling versions. The 6-of-a-kind pays are predictably WMS alas, with 5x bet for the Battleship outline, 2.5x Purple Star, 1.5X Gold Star and 1x for the Silver or Bronze Stars with five card values all at 0.5x for a full way of 6. the scatters are in the form of missiles which we will examining shortly, but there are no Wilds here in the base game. After any losing spin the grid may shrink and the guns to the bottom left and right open up, destroying a random amount of low-paying symbols (isn't that all of them?) and replacing them with higher ones. A win usually occurs, small. On the left of the grid are a series of vessels from Frigate, Submarine to Battle Cruiser and these have free spins attributed to them, 5, 10, 15, 25 or 50. On any spin, some of these vessels appear above the reels and you need missiles to land to shoot upwards and destroy segments of the vessels. If you destroy one in full, you get that amount of free games which have no increasing multiplier unlike Bonanza, but single Wilds can appear on the centre 4 main reels during them. You can retrigger them in the same way. During free games some ships won't display free game quantities but any of the 4 fixed jackpot amounts. These are 20, 100, 500 and 2500x bet. Sink one and you get that jackpot award.